It had been about a month since the NYC Half Marathon ran through the streets of Manhattan, and I hadn’t run much since then due to inclemental weather and a busy schedule. I was able to get in my long runs on the weekends leading up to the Brooklyn Half Marathon, but felt I was woefully unprepared as that fateful Sunday loomed. It had rained hard the night before, but the skies were clear and the weather was cool in anticipation of the race. I was supposed to run in the first wave of runners, but raising the number of entires to 25,000 (making it bigger than the NYC Half Marathon at 20,000) made the parking situation far worse than it had been in past years and caused me – and quite a few others – to miss my start, but I was able to head to the front of the second wave. Starting near the front of the second pack put me in a good spot. The first mile took us from the Brooklyn Museum down Washington Avenue to Flatbush Avenue, leading us to run around Grand Army Plaza. People cheered as we ran the streets for the first 5K of the race, the crowds becoming more dispersed as we got closer to Prospect Park. The loop around the park wasn’t too bad, but the hills got to be a bit of a strain, causing the obvious slow down in pace, and the inevitable downhill allowing for some recovery until we ran out of the park at mile 7. Mile 7 leads us out of the park and onto Ocean Parkway. Most people find this the most challenging part of the course due to it being a long, flat, exposed stretch for almost six miles. Normally I find the park to be far more challenging, but there was a minor change that altered it this year for me. The trees create shade on the left side of the street at the time of day we run, but this year the New York Road Runners moved the water stations to the right side of the street, so it became a run of trying to stay in the shade to keep from overheating, and crossing over to get water before running back to the shade. As we got past 12.5 miles, it was a turn to Coney Island and the home stretch. As I passed the 800M remaining sign, I started to become exhilarated, but I felt my body starting to rebel against me. Suddenly my body felt like it didn’t want to run anymore and wanted to go to the bathroom, but I had been watching the times on the mile markers and knew I was making very good time and had to push through. It became easier as I got onto the boardwalk and could see the finish line in the distance. One final burst and I pushed myself to cross it before breaking down. As soon as I crossed the line, I needed to step to the side and sit to cool down and catch my breath, but I had done it and got a new PR. 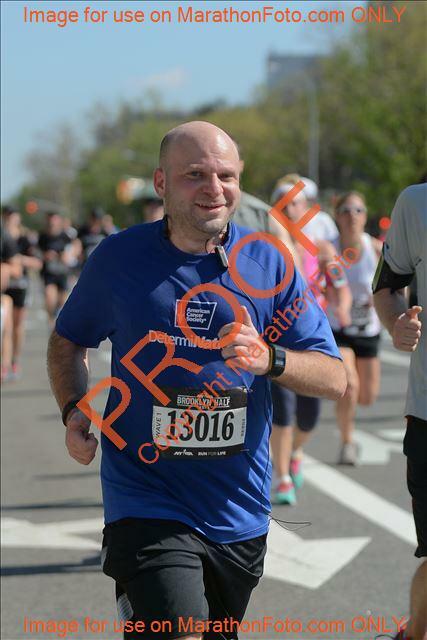 At the 2012 Staten Island Half Marathon, I finished the race at 1:54:18, but even as unprepared as I was, I was able to complete the 2014 Brooklyn Half Marathon in 1:53:50, beating my previous personal best by about 30 seconds. Even with the lack of proper training, parking issues, and body wanting to give up so close to the end, I was able to beat my previous best time for a half marathon and set the bar even higher for my future races.